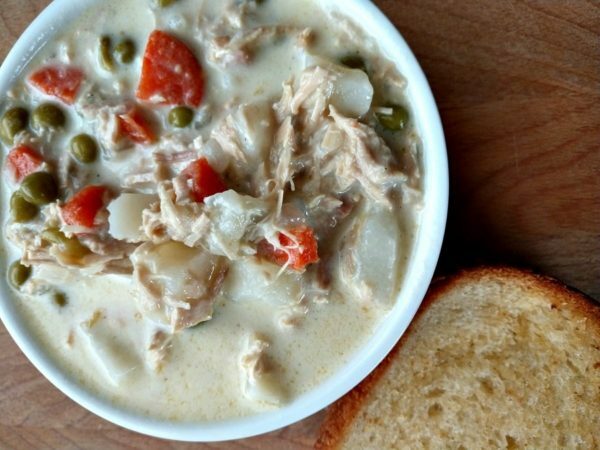 One of my favorite dishes to make for family is Chicken Pot Pie. I pride myself in making the best Chicken Pot Pie with a A+ homemade flaky pie crust. The crust is my favorite part and I use a crust on both the bottom of the pie and the top. This is the next best thing to a homemade pie crust pot pie. 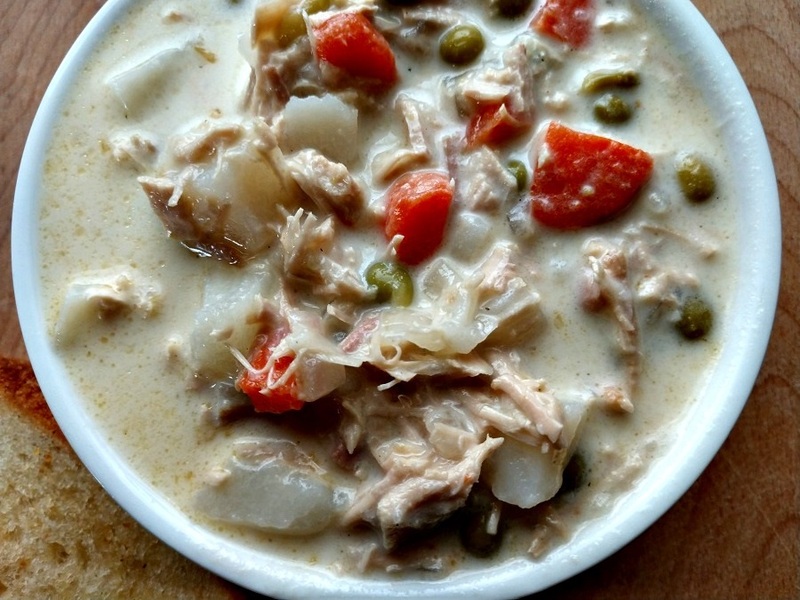 Crock-Pot Chicken Pot Pie Soup. Full of carrots, onions, peas, potatoes and chicken. Everyone needs a little bread with your soup to dip in the soup. I had a loaf of fresh Panera white bread and sliced it medium slices. I butter each side and use a little Morton Sea Salt Garlic on each side. Toast both sides on a griddle and use this with your soup. It is easy and very tasty. 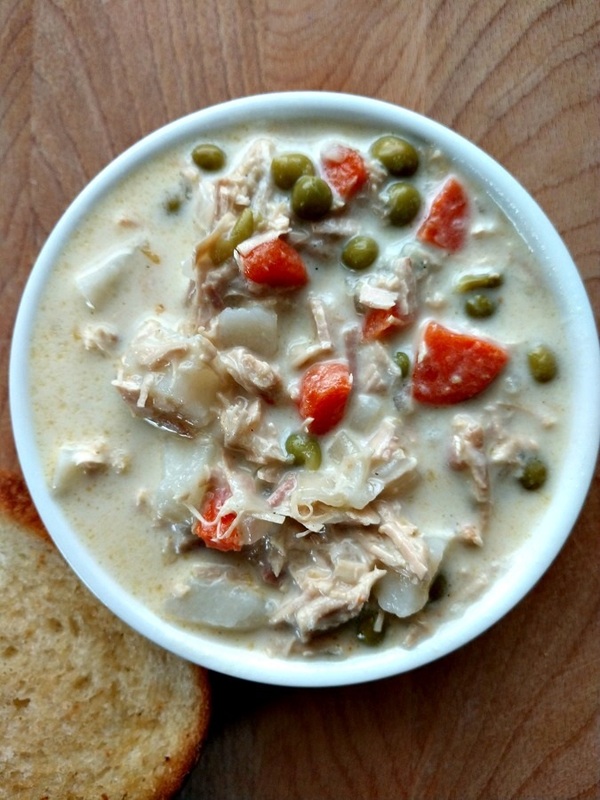 Hearty taste of homemade chicken pot pie in a creamy and easy to make soup. Serve with bread for your family. On the stove top, heat the butter, onion and garlic until the onions are translucent. Whisk in the flour and form a rue. Add the rue to a 5 qt or 6 qt slow cooker. Mix in chicken, chicken broth, potatoes, peas, carrots, rosemary, thyme, salt and pepper. Remove the chicken and shred. Return the shredded chicken to the slow cooker. Mix in the heavy cream and heat for another hour on high.